A properly installed rain gutter can protect your property from any and all kinds of water damage. If you really want your house to be secured from the water leakage or your landscape to retain its beauty, you will need to invest in a quality rain gutter. One of the best kinds of rain gutters is an aluminum rain gutter. And we say this with reason! Continue to read this blog to find out some of the major reasons why choosing an aluminum rain gutter is the best option for you. Many rain gutters which are quite heavy often face the trouble of sagging. A sagging gutter can lead to bigger problems like water leakage, insect infestation, and mold build-up. However, aluminum rain gutters do not cause any such problems due to their lightweight. Another great advantage of having aluminum rain gutters is that they would be very easy to move or carry around and install them. Their installation process would also be super simple and convenient. If you live in an area where downpour is a common occurrence, then having a small water gutter can be quite problematic. It wouldn’t be able to hold a large quantity of water, resulting in water overflow. This may further cause damage to your property. Aluminum is a strong material that typically has a wider channel, allowing a large amount of water to drain out safely from your home. Thus, having an aluminum rain gutter installed in your house can prove to be quite beneficial. Since aluminum is a seamless gutter, it requires little to no maintenance. This kind of gutter has no gaps in it. You wouldn’t have to worry about the debris blocking the pipe. No blockage further ensures less cleaning of the pipe which means you will have one less chore to do on your weekend! The best quality about aluminum rain gutters is that they are long-lasting, making them totally cost-effective. They neither rust nor crack even if there is any temperature change. The seamless aluminum gutters prevent all sorts of leakage and wreckage which may be caused due to heavy rain. This way, aluminum gutters can last for a really long period of time. While you might need to paint other kinds of gutters or simply have to choose one specific color from the limited range of colors, with aluminum gutters you will not be experiencing this kind of problem! If you are planning to install an aluminum rain gutter in your house, you will have a number of color options to choose from. Are you looking for a reliable place to get an aluminum rain gutter installed in your house? 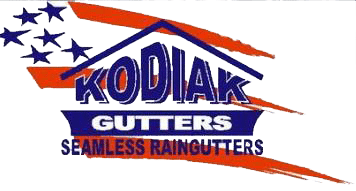 Your best option is to choose Kodiak Gutters!